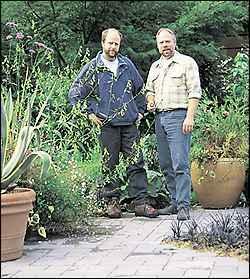 Dan Hinkley, left, and Robert Jones, no doubt pondering the future, in the garden at Heronswood. The new Heronswood Nursery catalog is out, with nary a listing for tomatoes or iceberg lettuce. Its 256 pages continue to offer the juicy selection of trees, shrubs, perennials and grasses that Heronswood junkies depend upon to infuse their gardens with the latest and the best. Dan Hinkley's voice fills the pages with tales from recent travels. I'm not sure we needed to know about the face in the soup or the dogs on short chains, but it is, after all, his publication. And no corporate entity has Hinkley on a chain of any length; his offbeat humor continues to shine with Latin name games and outrageous puns, and, as always, his fond and compelling plant descriptions induce acute cravings in his readers. Last summer, gardeners gasped over the sale of homegrown Heronswood to W. Atlee Burpee. It seemed an unlikely union. Heronswood has a worldwide reputation for being first with "gotta-have-it" plants, while Burpee's image is as stodgy as the familiar annuals and vegetable seed it has offered for 125 years. If Heronswood is the Donna Karan or Calvin Klein of the plant world, then Burpee is the Sears Roebuck. I first heard about the sale when I was visiting a garden outside of London just a few days after it happened. The staff weeding the borders were hotly debating what the sale meant to the future of horticulture as we know it. So why would two such disparate entities co-mingle? Heronswood's attractions are the more obvious. While it mails out only about 50,000 catalogs each year, compared to 3.5 million from Wayside or White Flower Farm, Heronswood has an enviably high percentage of catalog recipients who place orders. In 1989, Hinkley and partner Robert Jones sent out 250 catalogs and packaged up 45 orders. Last year more than 40 employees processed 7,000 orders for 85,000 plants. That is pretty big business in fairly short order. Now In Bloom Coral bark maple (Acer palmatum 'Sango-kaku') has glowingly bright coral-red bark that makes a fine focal point for the winter landscape. Its delicate pale-green leaves turn yellow in autumn. Burpee is one of the oldest and most recognized names in horticulture, but it sold only seed. In recent years there's been a shift away from growing from seed, due to the ready availability of nearly every kind of plant. It was clearly time for Burpee to expand its offerings; Heronswood's huge stock of desirable plants, plus its talented staff, must have looked pretty appealing. But why would Heronswood, with all its success and even adulation, join forces with Burpee? Hinkley says they weren't looking to sell, but explains, "Robert and I were drowning in the responsibilities of this thing we had created . . . there was no down time." Plus they were out of room. Burpee came along offering both money for expansion and the gift of time. Hinkley says that Burpee owner George Ball respects Heronswood as a unique entity, and plans few changes besides the welcome one of enlarging the nursery and gardens to twice their current size. Photos may be added to the catalog, but it will continue to be written by Hinkley. What will change is that some of the catalog's mainstay plants will be targeted for a wider audience - taken on by Burpee as brand items and marketed through its stores, Web site and catalog. Hinkley and Jones plan to make good use of that newfound time. They'll continue to manage the nursery. Jones, an architect, is designing a new house, where they look forward to having a smaller, private garden. Hinkley is scheduled to give 57 talks in several countries this year, hopes to finish the three books he is writing, and plans to devote more time to expeditions. He'll journey twice to Europe and Japan this spring and then to Nepal or southeast Tibet in the autumn, bringing back yet more plants to excite us. Speaking of . . . did anyone notice that rare Chinese Hepatica henryi on page 185 of the new catalog?